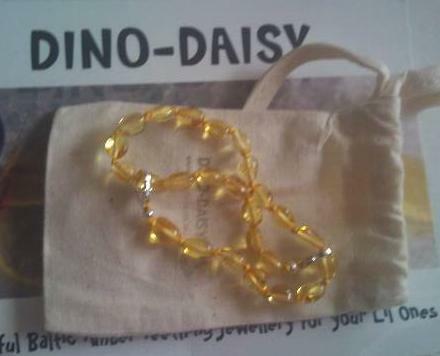 My Mummy's Pennies: Dino Daisy's Baltic Amber Teething Anklet - Pretty and Practical! 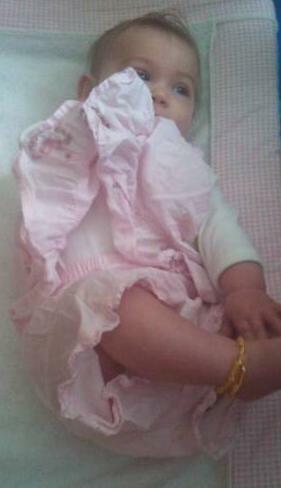 Dino Daisy's Baltic Amber Teething Anklet - Pretty and Practical! My daughter Elizabeth Rose has recently turned six months old and as all you Mummies out there will be aware, this is the age that our happy smiley little angels become unhappy, cranky, drooling little monsters, that chomp on everything in sight and reintroduce us to sleepless nights, thanks to those naughty first toothy pegs! With my son Ben, we went though this stage quite early (four months), and as he was one of the first of his 'baby friends' to get teeth I had no one to ask advice of, so we just suffered through it, going through tubes upon tubes of teething gel, teething powders and a steady rotation of cooled teethers for him to gnaw on! Around a month ago I was at a nappuccino during 'Real Nappy Week' and was chatting to some mummies who were 'fluff experts', the conversation came round to teething and I confessed that Elizabeth Rose was starting to drool a lot and chomp on things and that I was dreading going through the teething phase again! This is when I was introduced to the the idea of Baltic Amber! One mummy revealed to me that when wearing his necklace her little one had actually had teeth come though without her noticing! Baltic Amber contains Succinic Acid, a known analgesic reputed to boost the immune system, reduce inflammation and accelerate the healing of wounds. For centuries throughout Europe, Baltic amber has been used for healing and wellbeing. When worn by your little ones, the warmth from their body releases the amber's natural oils into the skin, soothing the misery of teething aches and pains offering a completely natural teething remedy. The lovely Kate from Dino Daisy sent me out a beautiful Lemon Beans on Gold thread Adjustable Teething Anklet to try with Elizabeth Rose. 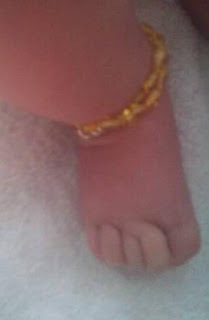 (I chose a teething anklet as I felt a little uncomfortable having something around my wriggly baby's neck). It arrived beautifully packaged in a natural cotton bag with care instructions printed on an accompanying card. She has now been wearing this for almost two weeks and I have to say I am impressed! Firstly just by how it looks and functions as a piece of jewellery! The beautiful anklet is easy for me to take on and off my daughter but secure enough to prevent her from removing it and because of the simple adjustable design, it will grow with her (and would even fit me as a bracelet!) Also the colour of the lemon beads on the gold thread really brings out her big blue eyes and suits her milky colouring. It must be comfortable on her as she doesn't play with it at all (not even when sucking on her toes!) The strong thread is knotted in-between each bead so in the unlikely event it was to break or snap only one bead would come away, and the beads are small enough not to pose a chocking hazard if swallowed by a baby or child. Obviously jewellery should not be worn by babies when unsupervised. Now when it comes to the actual healing properties of the Baltic Amber, although I was hopeful that this would ease Elizabeth's teething pain and discomfort, I have to admit my husband was sceptical. Where I have always favoured natural remedies and products, my other half prefers his pain relief to come in a packet or tube with a list of ingredients on the side! But as he so often does, he humoured me, thinking it won't make a difference but at least it looks pretty! After two weeks of use, even he has admitted he can see a difference in Elizabeth! When we received the anklet she had really started to suffer with her teeth, biting her fists, soaking tops with drool so badly they would have to be changed within an hour of putting them on, waking two or three times in the night and suddenly crying out in pain. After only a few days of wearing it she became calmer, slept better (babies must always be supervised when wearing, Elizabeth sleeps with us and it was worn under a babygrow and baby sleeping bag) and although still biting on things and drooling she no longer soaks her clothes 6 times a day! Over the past two weeks I have seen the two little white lumps protruding from Elizabeth's gums grow bigger and bigger and now look like they are both ready to break out of the gum any day but instead of her discomfort growing too she has remained a happy little bunny! Just to show you what a difference it has made, I was routing though the changing bag this morning and felt something at the bottom, when I pulled it out I realised it was the unopened tube of teething gel I had purchased just before the anklet arrived! I had been going though this like it was going out of fashion, but have not used any for almost two weeks! That really does show how effective the anklet has been! I would definitely recommend Dino Daisy Baltic Amber Teething Jewellery to any mummies who have a little one suffering with their teeth. I just wish I had known about them with Ben! The adjustable anklet at £10 is definitely a 'Mummy Saving' buy (just think how much you'll save on teething gel!) and I think I will be investing in a necklace for Elizabeth soon too, as having the anklet on her has shown me that the necklace would be safe around her neck and I doubt she would even bother to play with it after a few days. I also now have a great new baby gift idea for my 'mummy to be' friends! Whilst Elizabeth has been wearing it we have had lovely comments everywhere we go, mummies from playgroups, baby swimming class and the park all want to know where they can get one! And now you my lucky followers have the chance to win your choice of a Baltic Amber Teething Necklace from http://www.dinodaisy.co.uk/ (from the Original Collection with the screw clasps). And the Winner (picked by random.org) is....Emma Spears! Congratulations Emma! Please go to http://www.dinodaisy.co.uk/ and choose your prize from any one of the Baltic Amber Teething Necklaces in stock on the site (from the Original Collection with the screw clasps only) then email me your choice and your postal address on jendixon35@googlemail.com and I will pass your details onto the lovely Kate at Dino-Daisy! 3. Leave a comment below with your facebook name and a 'Mummy Saving' tip! I will pick a winner at random, but will share some of the best 'Mummy Saving' tips on the facebook page! *update* as some people are having trouble 'following' the blog at the moment I've decided to take that out as a condition of entry, if you can it would be great if you do follow, but if your having diofficulties then no worries just like the facebook pages and leave your mummy saving tip below! Competition will close 9pm 7th July. When you have a newborn with explosive nappies rub a little washing up liquid into the stains before washing with your regular detergent in the mashine. This will save all those first whites from nasty yellow stains. if your baby wont go to sleep without the sound of the hoover/ hairdryer, etc, record the sound onto your computer and then put it on a cd/ mp3 player so you can then play the CD/ mp3 of the noise rather than having the hairdryer or hoover going all night. My tip is about stain remover! The best you can get is sunshine! Leave the clothes on the windowsill for a day or two and the sun will bleach out the stain" works in moonlight too! People spend alot of money on new baby clothes when they only get to wear them a few times. I buy most of my baby clothes on ebay, carboots and NCT nearlt new sales and when she grows out of them I sell on ebay and NCT new sales to finance new clothes! my best money saving tip would be sign up to all baby clubs to get lots of freebies and vouchers! You really can save a small fortune, and if you start doing it whilst pregnant you'll have a huge hampper of stuff to get you started! There are many sites for vouchers, just google it, and print them off! HI :) my best tip ever is to use washable baby wipes!much cheaper and nicer than sposies!!! My facebook name is Joanne Leese. My money saving tip is to look for toys at carboots and charity shops. The plastic ones can be cleaned up easily. My top tip is use reusable wipes, even if you use disposable nappies they will still save you a fortune, and if you think they are a faff there are kits that make them as easy to use as disposables. You don't always realise how much a couple of packs of wipes a week adds up to until you actually add it up!